The Swiss luxury watch manufacturer Breitling is famous for its world-renowned pilot's watches and chronographs. Highlights include watches with split-seconds chronographs and high-tech timepieces with smartwatch capabilities and distress signals. 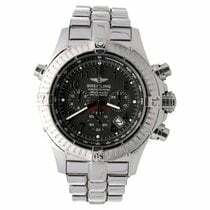 Breitling is the most renowned Swiss manufacturer of pilot's watches. The company has enjoyed an exceptional reputation in this sector for decades. Its catalog includes the legendary Navitimer as well as high-tech pieces with quartz movements and special functions. Many Breitling timepieces are designed to meet the demands of modern aviation. They can analyze flight data and send distress signals in case of emergency. That being said, the manufacturer ultimately stands for attractive and robust luxury watches, each with high-quality technology and a consistent design. This isn't only true of their pilot's watches: Breitling also offers a wide array of underwater timepieces. Diving watches from the Superocean and Avenger collections have long been winning over technology-oriented watch fans. The Superocean Héritage line includes vintage-inspired pieces that are geared toward retro-watch enthusiasts. Though it was first introduced in 2018, the Navitimer 8 also includes design elements inspired by historic watches. All in all, the Breitling catalog is made up of several collections composed of desirable retro watches as well as state-of-the-art timepieces. Most of the watches are powered by mechanical movements. Since 1999, every movement has been certified by the Official Swiss Chronometer Testing Institute (COSC). In 2009, the Grenchen-based company introduced their own caliber, the B01, with a chronograph function. One highlight is the Navitimer B03 Chronograph Rattrapante 45 with a split-seconds chronograph that was developed in-house. It's impossible to separate the Breitling brand from the Navitimer model. This world-famous pilot's watch with chronograph functionality and a slide rule bezel first entered the market in 1952 and remains the Grenchen-based manufacturer's most successful model to date. Current stainless steel versions with the in-house B01 chronograph caliber cost around 6,300 USD new. Pre-owned pieces go for about 5,900 USD. This pilot's watch has a 43-mm case. The variant in 18-karat rose gold costs around 15,000 new and almost 12,300 USD pre-owned. If you prefer the especially uncluttered, 46-mm stainless steel edition, be sure to set aside around 6,500 USD for a never-worn model. A pre-owned model comes in at about 5,700 USD. You can get one of the 45-mm rattrapante chronographs with the in-house caliber B03 for about 9,500 USD. The rose gold version with a split-seconds (or rattrapante) chronograph is significantly more expensive at over 30,700 USD. Older Navitimer chronographs without an in-house caliber are markedly more affordable. You can purchase one of these pieces for about 3,900 USD pre-owned and 4,200 USD in mint condition. The automatic Valjoux 7750 caliber ticks away in many of these models. For fans of vintage watches, early Navitimer models with the reference number 806 are particularly interesting. Those made of stainless steel are especially sought-after and cost between 3,700 and 12,300 USD depending on their condition. The manually-wound Venus 178 caliber powers most ref. 806 pieces. Watches with the Valjoux caliber 72 are extremely rare. This movement is also wound by hand and was only used in the Navitimer for a short period of time in the mid-1950s. Breitling announced the release of the Navitimer 8 prior to Baselworld 2018, drawing the attention of the entire industry to the brand and series. 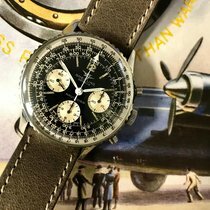 Although this line bears the name of the famous Breitling pilot's watch, these watches don't look like Navitimers at first glance. This is mostly due to the lack of a slide rule bezel, which enables the wearer to calculate distances, average speeds, and climb and descent rates. The Navitimer 8 has a bidirectional fluted bezel and is best suited for measuring periods of time thanks to its arrow markers. The design of the new collection is inspired by onboard instruments from years gone by. Even the '8' in the name has historic origins: It comes from the Huit Aviation department founded by Willy Breitling in 1938. The French word "huit" means "eight." The 'eight' in the department's name originated from the fact that their onboard clocks had an eight-day power reserve. The Navitimer 8 has a maximum power reserve of 70 hours, or almost three days. Currently, this collection includes chronographs, world timers, versions with day and date displays, simple three-hand editions with a date, and a 50-mm model with three hands and a left-sided crown. The 50-mm timepiece is inspired by the watches worn by bomber pilots during World War II. At its introduction, the list price for a stainless steel Navitimer 8 B01 Chronograph 43 with an in-house caliber was 8,600 USD with a leather strap and 9,000 USD with a steel bracelet. On Chrono24, you can find both editions for as little as 6,100 USD. The variant in 18-karat rose gold costs around 18,400 USD new and comes with a brown crocodile leather strap. Chronographs featuring the Valjoux 7750, which Breitling calls caliber 13, are much less expensive. You can get one of these stopwatches starting at 4,400 USD. Three-hand models with a date display at 6 o'clock are even more affordable at 3,200 USD. The Day-Date version is only slightly more expensive with prices starting at 3,300 USD. The Navitimer 8 B35 Automatic Unitime 43 with a world time function demands 6,500 USD with a leather strap and 6,800 USD with a steel bracelet. How much do Breitling's diving watches cost? In addition to numerous pilot's watches, Breitling also offers robust diving watches. For example, the Avenger II Seawolf is water resistant to 3,000 m (300 bar, 9,843 ft) and is quite massive with its 45-mm diameter and height of 18.4 mm. Plan to spend a good 3,400 USD for a model in mint condition and 3,200 USD for a pre-owned piece. At 44, 42, or 36 mm, the Superocean II feels a bit more classic. The smallest version is water resistant to 200 m (20 bar, 656 ft) and is more geared toward women. It costs around 3,100 USD new and 2,300 USD pre-owned. The largest edition is water resistant to 1,000 m (100 bar, 3281 ft) and comes in at 2,900 USD pre-owned and 3,400 USD new. Set aside around 3,300 USD for the 42-mm version in mint condition and 2,800 USD for a pre-owned model. Since retro watches have been highly coveted for quite a few years now, the vintage-inspired diving watches in the Superocean Héritage collection are particularly fashionable. These wristwatches are contemporary reinterpretations of earlier models from the 1950s. Some features of the current collection include fluted ceramic bezels, tapered indices, a sword-shaped minute hand, and an arrow-shaped hour hand. You can get a new, 46-mm chronograph from this collection for 4,300 USD. A pre-owned piece costs just under 3,700 USD. Since 2018, 44-mm chronographs with the B01 in-house caliber are available; list prices start around 8,800 USD. If you prefer a cleaner dial, you should take a closer look at the retro three-hand variants. The 42-mm version with a braided steel bracelet goes for 3,400 USD new and 3,200 USD pre-owned. The three-hand watch is also available as a 46-mm model at prices around 3,200 USD. You will find Breitling's most elegant and versatile timepieces in their Transocean collection. Top models in this line have chronograph and world time functions, making them perfect for frequent travelers. However, there are also classic watches with three hands and day and date displays. The cases of these dress watches come in stainless steel or 18-karat red gold. For the band, you can choose between crocodile leather or braided steel. You can purchase a mint-condition, 43-mm Transocean Day-Date for as little as 4,300 USD. A never-worn red gold model costs about 13,800 USD. Pre-owned Day-Date models are harder to find, making them only slightly less expensive. A new Transocean Chronograph with an in-house Breitling 01 caliber demands almost 6,500 USD. Pre-owned editions cost about 1,200 USD less. You can find the 46-mm Transocean Chronograph Unitime with chronograph and world time functions for around 9,000 USD new and 7,400 USD pre-owned. How much do the Chronomat and the Avenger II cost? The Chronomat and the Avenger are some of the most distinctive and masculine Breitling watches out there. Measuring between 44 and 50 mm in diameter and over 17 mm thick, these timepieces are best suited to larger arms and short sleeve shirts. In the movie Die Hard with a Vengeance, John McClane, played by Bruce Willis, relies on the accuracy of a Chronomat. The famous American rapper Ludacris is also known to wear a massive Breitling timepiece, though he prefers the Super Avenger. You will need to spend almost 6,200 USD for a new example of this 48-mm watch. Pre-owned examples are markedly less expensive at around 4,500 USD. The 50-mm Avenger Hurricane is constructed of lightweight black Breitlight, a material made up of composite fibers developed by Breitling. It is significantly lighter than stainless steel and very scratch-resistant. This timepiece costs about 7,400 USD new. If you want to follow in Bruce Willis' footsteps and wear a Chronomat, you will need around 6,100 USD for a piece in mint condition and 4,700 USD for a pre-owned one. Models in this price range include the in-house caliber B01. Older versions with the Valjoux 7750 are much less expensive and cost as little as 2,500 USD pre-owned. If you're lucky, you may even find one for under 2,500 USD. The Navitimer is usually the first watch that comes to mind when people think of Breitling. This pilot's watch, with its striking black dial, was originally introduced in 1952. Its scales enable a number of useful aviation calculations. For example, one can calculate speed, flight time, climb and descent rates, distance, and fuel consumption using the Navitimer. It's not just a watch, it's a specialized aviation calculator. Today, modern cockpit instruments can also provide this information, but they can't replace the Navitimer's charm. The significance of this watch within Breitling's product line is revealed by the name of its caliber: the Breitling 01, their first in-house movement. This automatic caliber has a chronograph function and can time periods of up to 12 hours. Its power reserve lasts for around 70 hours. The case is available in either 18-karat rose gold or stainless steel. The standard version has a diameter of 43 mm, though 46-mm and 48-mm versions are also available. Furthermore, it is available with additional complications, such as a second time zone. The Navitimer is water resistant to 30 m (3 bar, 98 ft). The Montbrillant is another pilot's watch from Breitling which closely resembles the Navitimer and features a white dial as well as the same 01 caliber. An entirely different yet equally legendary Breitling pilot's watch is the Emergency from the Professional series. This watch has helped save lives since 1995, thanks to its built-in distress call transmitter. It transmits a signal at the international frequency 121.5 MHz, which search planes can track in calm seas or over flat land from a distance of approximately 170 km (105 mi). In 2003, two British crew members were saved thanks to their watches after their helicopter crashed in Antarctica. The Emergency II, the newest version of the watch available since 2013, can also transmit a distress signal at 406.04 MHz, which is monitored by satellites. In addition to the distress signal, the watch features a countdown timer, second time zone, and an alarm function. These functions obviously require energy to operate. Therefore, the Emergency is outfitted with a battery that lasts about two and a half years. Its quartz movement, the Breitling 76, compensates for temperature fluctuations, which can cause inaccuracy. The time can be displayed in analog or digital fashion. Its case is made of black titanium and has a large diameter of 51 mm and a thickness of 21.6 mm. Without its band, the Emergency weighs 144 g.
The Superocean is designed to be used at great depths. It's a classic diving watch with all the necessary features: water resistance to 20 bar (200 m, 656 ft), a unidirectional bezel to keep track of dive times, luminous hands, and a fluorescent zero mark on its bezel. It also features a screw-down crown, which is protected from damage by a crown guard. The smallest version of the Superocean features a 36-mm stainless steel case, while two larger versions measure in at 42 mm and 36 mm in diameter. Other versions of the watch can go to even deeper depths: The Superocean II 42 is waterproof to 50 bar (500 m, 1,640 ft) and is comparable to the Omega Seamaster Planet Ocean. Both diving watches are perfectly suited for deep diving. Even more sturdy is the Superocean Chronograph M2000, which can dive down to 2,000 m (6,562 ft). This timepiece is 46 mm in diameter and powered by a quartz movement. Watches in the Superocean collection usually use automatic calibers. However, these models are not the only Breitling watches meant for extreme depths. The Avenger II Seawolf can withstand pressure to 300 bar (3,000 m, 9,843 ft), for example, and is powered by the automatic caliber Breitling 17. The watches in the Superocean Heritage series are modeled after timepieces from the first era of diving watches in the 1950s. With a water resistance of 20 bar (200 m, 656 ft), the Superocean Heritage floats in the usual range of watches suitable for recreational divers. Its bezel is available in black, blue, or green, as well as rose gold. The Chronomat's tachymetrer scale enables the wearer to calculate speed. The scale is located on the rehaut, which also allows the watch to have a unidirectional bezel. As part of its chronograph function, the watch has 30-minute and 12-hour counters on subdials as well as a large seconds hand. These features allow the wearer to time periods up to 12 hours. The sportiest version of the Chronomat is the 44 Raven. Its dial and case are deep black, while the rehaut, small hands, and numerals on the bezel come in a contrasting orange. The Chronomat 44 Raven is an expressive exception within Breitling's tool-watch-dominated catalog. The Chronomat is also available with a second time zone. Thanks to its tachymeter scale and stopwatch function, this watch is a perfect alternative to the Rolex Daytona or the Omega Speedmaster. Parallels also exist between Breitling timepieces and the watches in Omega's more classic collections. Breitling's Transocean is comparable to Omega's De Ville. This collection contains simple three-hand watches with day and date displays as well as small pieces of art, such as the Transocean Chronograph 1461. This watch's mechanical movement is comprised of 450 individual pieces and is so accurate that its date only has to be corrected every 1,461 days at the leap year. While the Transocean Chronograph 1461 is bound to traditional craftsmanship, the Exospace B55 from the Professional series represents the modern end of the Breitling spectrum. This watch can connect to smartphones via Bluetooth and is packed full of functions: an alarm with up to seven different individual settings, UTC time, a countdown timer, and a chronograph. The quartz movement B55 ticks away inside the watch and runs 10 times more precisely than the average quartz movement. A special miniature rechargeable battery powers the Exospace B55. The price for an Exospace B55 sits around 8,000 USD. Léon Breitling founded the company in 1884. Breitling wears its long history as an independent company as a badge of honor. The manufacturer became part of the British CVC Capital Partners group in 2017. Georges Kern, the former CEO of IWC and former Head of Watchmaking at Richemont, also joined Breitling in 2017 and has been at the wheel ever since. 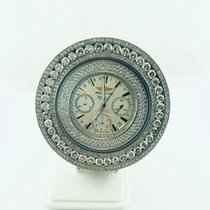 The Royal Air Force became a customer in 1936 and used Breitling clocks for their ships. The US Air Force followed suit and ordered Breitling's Chronomat wristwatches when they premiered in 1942. In the early 1960s, the manufacturer developed a version of the Navitimer with a 24-hour clock instead of the traditional 12. Astronaut Scott Carpenter wore this watch during his 1962 space flight in order to tell if it was day or night on Earth. In 1979, Willy Breitling sold the company to the pilot and businessman Ernest Schneider. Schneider was able to put the company back on track. The Schneider family owns shares in the company to this day. Breitling's commitment to aviation expresses itself in many different ways. They have their own jet team, the Breitling Jet Team, which is the largest privately-owned aerobatic display team of its kind. The team flies seven Czech Aero L-39 Albatros jets. In addition, they support the Wingwalkers, who perform on the wings of biplanes. Breitling also sponsors the survival of the last flight-capable Lockheed Super Constellation in Europe. This propeller plane with four engines is lovingly nicknamed "Super Connie." These planes formed the backbone of modern long-haul passenger flights during the 1950s. The Breitling Super Constellation L-1049A (HB-RSC) is stationed in Switzerland.